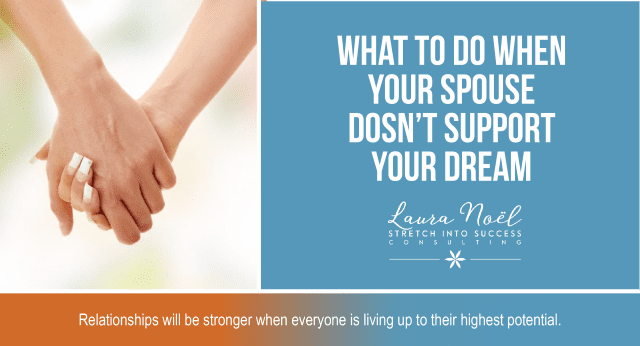 What to do when your partner or spouse doesn’t support your dreams or career goals. Over the course of several years, helping people achieve their goals, I get to meet a lot of different people from various backgrounds, walks of life, income brackets and professions. When I talk to any one of these people, the common thread that connects them is, they all have dreams and aspirations. More often than not, the dreams usually fall into one or more of three categories. They want to wake up feeling enthused about how they are spending their days. If you’re counting down the hours until you can leave your 9 to 5 then it’s time to find something you are passionate about…life is short. They all want to be free from financial concerns and have enough income to buy the things they want, take time off from work to go on a vacation with family or friends or simply go on an adventure by themselves. Lastly, they want to be around like-minded people who are upbeat, positive, enthusiastic about life and most importantly, people who lift them up and support them and their dreams. Sometimes that last category can seem like the most difficult hurdle to overcome. After all, it’s our family and closest friends who love us the most, see us serving in our highest potential and want what’s best for us…right? I think for the most part they do, however, there are a few things at play that may make it seem like they are not in your corner. So, you’ve got this dream of something you’d love to be, do or have and you are on top of the world, your vision is clear and you’ve never felt so sure of anything before…this dream feels right and you can’t wait to share it with the people you care about most. Here are the top 5 reasons why you might not be getting the warm fuzzy and green light you were hoping for. 1.Your goal goes against your loved one’s current belief system or paradigm. A paradigm is multitude of beliefs and habits stored in our subconscious minds. Since we are a product of our environment, many of these beliefs were passed down from generation to generation. So maybe you want to become a best selling author or start a business and your partner has beliefs around how difficult it is or how most businesses fail within the first two years. When you tell your partner you want to invest in yourself, get coaching, spend money on publishing the book or starting the business, to them it seems wasteful or impossible. 2.Your partner is worried about how this new career of goal will impact the family, the relationship and your life together. The idea of having to change their lifestyle is too much. People don’t like being changed; however, that doesn’t mean that they won’t be open to change. 3. They are not enrolled in your vision of dream and therefore the risk, in their mind, is not worth it. Often times, we keep our deepest dreams and desires to ourselves because we don’t see how we can reach our goal. When we finally make the decision to go for what we want, it can seem like it’s just an idea that came up out of the blue. 4. You partner is stuck in a rut and even though they want you to be happy, they also don’t want you to leave them behind. 5. They have deep rooted beliefs surrounding money or the idea that you should be grateful for what you have. They have beliefs centered around worthiness and that it’s greedy to want more than you’ve been given. There is a big difference between being grateful for what you have and settling for what you have. If your partner isn’t on board with your dreams, does that mean you have to settle, put your dreams on the back burner and live a less than fulfilling life? Heck no! If you have visions of what you’d like to be, do or have, you have to know that vision is a place. You’ll never be given the inspiration to do something if you weren’t capable of manifesting it. Get clear on what you want both in terms of your goal and with regard to how you want to feel when you are communicating your goal and request for support from your partner. Get clear on how you want them to receive this conversation. Take time, multiple times a day, to mentally rehearse this conversation…not how you think it will go, but how you WANT it to unfold. Enroll them in your dream and vision, not just for you but for you as a family and let them know that when you are being the fullest expression of yourself, living your purpose, the more present you can be for them. Understand when they are speaking from fear, lack, worry and doubt that is their paradigm speaking. Don’t argue with their paradigm, rather ask questions to get to the root cause of their concern and address that. Your gifts are too important, not to be shared. I’m not suggesting the road is always going to be easy. In fact, you are going to face challenges. When you overcome those challenges, you reap the rewards and growth. Consider this conversation with your loved one as an opportunity for you to grow. You get to communicate in an enrolling way, your vision. You get to take a stand for yourself. You get to be courageous and you get to set the example for those around you, giving them permission to step into their gifts and greatness as well. The beliefs your loved one or partner is having are rooted in fear. At this point, you have a choice; you can buy into their fear or you can buy into your dream. You and only you, can live your life no one else can do it for you. When you allow someone else or external circumstances to control your decisions, you are giving them power over you. It’s still a choice, it’s your choice but it’s important to realize, you do not need someone else’ permission to live your life. Honestly, relationships will be stronger when everyone is living up to their highest potential and not feeling stuck in resentment for being “held back”.